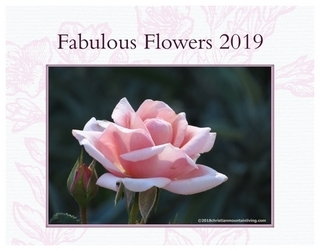 Christian Mountain Living is pleased to offer this exceptional floral calendar for 2019. Each page is lightly watermarked with a muted floral pattern for a more formal, lovely textural element. This stunning calendar features 12 original photographs of flowers or garden plants. As with all of our calendars, the photos are professionally printed full color on 100# card stock, wire bound for flush hanging on your wall. Click on the calendar picture or here to view and purchase securely. Our calendars are all $12.99 plus shipping.